World Renowned Professional Heavy Duty Seaming /Arrissing Machines. The finest manually operated high performance seaming machines in the world. 650kg of powerful round-the-clock reliability even in the harshest tempering environments. High speed abrasive and diamond grinding belts yet low r.p.m. bearing and motor speeds make this design so popular. 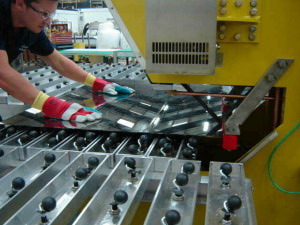 DRY operation machines incorporate air floatation tables and dust extraction. WET machines incorporate unique water-bath tables where castor balls are permanently semi-submerged and rinse themselves each time they turn, when glass is passed across them.